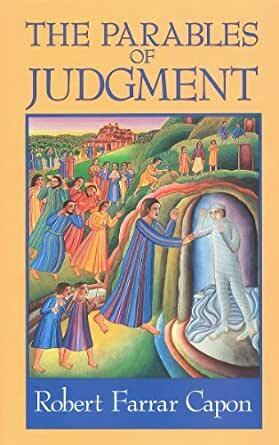 Parables of Judgment - Kindle edition by Robert Farrar Capon. Religion & Spirituality Kindle eBooks @ Amazon.com. Length: 181 pages Word Wise: Enabled Matchbook Price: $2.99 What's this? Good book. Arrived when expected. Very pleased with buyer. Very deep. And thought provoking. And gives one a peaceful feeling. that there was a single volume edition of these three books - so I ended spending a bit more for each. So far, I have to say that they are something of a disappointment though not without redeeming features. They're a little less scholarly than I expected. Having heard of "Capon" for quite some time among the pastoral circles I frequent I finally determined I had to order some of his books. This is the first one that arrived, so I read it first. I am converted. Some tell me he is a universalist, and that is the only caution they give to reading this man's work. Having read this book I don't see him as a universalist, and if he is maybe I am too. He sees that hell is a reality, and will be a reality for many, just not for the reasons that many think. He draws the line at faith those who refuse to believe are the ones left out of the party. It is a great book. The exegesis is superb, the writing brilliant. Robert Farrar Capon communicates grace in the midst of judgment. I can't wait to read the other two books in this series, and the many others available by this author. His way with words is astounding. Anyone who preaches on even a semi regular basis ought to read this man's work, if for nothing else to lift a couple phrases for their own work. Capon uses the parables of judgment as a basis for his exegesis about the mysterious working of God in this world and in its history. 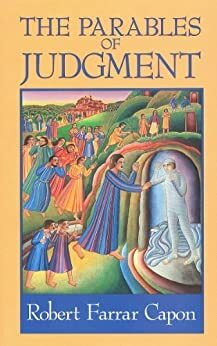 This book is part of his trilogy over the parables and as such one expects to find many of the same ideas articulated in this book that are in the other two. This expectation is fulfilled and amplified in this work. In reading the other two books, I remember thinking to myself, "Well, you have a point, but what about the parable about so and so?" In this work, those so and so parables that were my wall of defense to Capon's arguments became transformed into his coup de grace. This work is not one to be read -- it is to be ingested and thoughtfully considered. One cannot assume that reading a work like this leaves one unchanged. I can honestly say that Capon's work with the parables of judgment has helped me see that there is not a Marcionic dichotomy between YHWH and the Abba of Christ Jesus.